Growing up on a farm south of Winnipeg, I dreamt of British Columbia. province. I fell in love sight unseen with the west beyond the west. Boasting the mighty Gatineau Hills, the Outaouais region of west Quebec where I grew up was only marginally more mountain-like than Barman’s Manitoba farm. By the time I was in junior high, still a few years away from even seeing a mountain firsthand, I already knew that I would one day call “The West” home. The dominant orientation of nearly four centuries of North American history has been westward. While the lure of cheap land and abundant resources (enabled by the tragic effects of colonial encounter) propelled the continent’s initial resettlement, in later years, the call of the mountains helped sustain this westward migration. North America’s first mountaineers (in the modern, European sense) came from eastern Canada and New England along newly-built railroads, seeking adventure in the famed Canadian Rockies. Even the Alpine Club of Canada was founded in Winnipeg of all places. Surely, every western Canadian town has strong eastern ties, dating back centuries and continuing up to the present. It is a recurring joke here in Whistler to wonder out loud if there are any people left in Ontario (or Australia, for that matter), for they all seem to have moved here. Many of my friends here in Whistler went to the same high school as me, and I have childhood friends spread throughout western mountain towns. Recently, I uncovered two much older links between my childhood home and the Mountain West. "Mouth of the Homathko River" by Frederick Whymper, 1864. The painting depicts the terminus of Waddingtons Road, also known as Waddington Harbour, where the Homathko flows into Bute Inlet. Source: British Columbia Archives. I’ve been studying Alfred Waddington for a few years now. The British-born, Victoria-based entrepreneur was the brains, money, and enthusiasm behind an audacious plan to build a wagon road from British Columbia’s Bute Inlet to the booming Cariboo goldfields in the early 1860s. Despite having to pass through the incredibly rugged central Coast Mountains, by April 1864 the project was progressing well and the work crew optimistically hoped to complete the road that summer. But it was not meant to be. Following a dispute over pay and maltreatment, a party of local Tsilhqot’in men attacked and killed fourteen of Waddington’s work crew. In response the colonial authorities organized a massive manhunt through the central British Columbia wilderness which ended with the hanging of six Tsilhqot’in men. This series of events, now known as the Chilcotin War, was one of the most tramautic and controversial episodes in British Columbia history. The Chilcotin War put an immediate halt to Waddington’s road-building enterprise, and although his route was nearly selected as the final leg of the first trans-Canada railway, only a handful of people of European descent visited the region over the next half century. 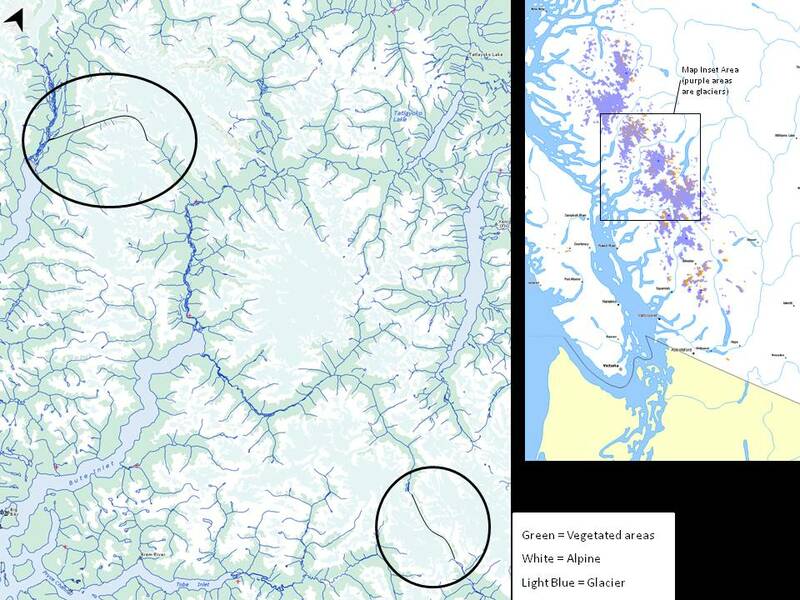 The central Coast Mountains became deepest, darkest British Columbia. The remains of Waddingtons trail through the Homathko Canyon. Photograph taken by Charles Horetzky, a member of the 1872 Canadian Pacific Railway exploratory survey, led by Sir Sandforn Fleming. Source: British Columbia Archives. I’ve been fascinated by this story for some time, but only while reading an out-of-print biography of Waddington a few months ago did I learn of the man’s final years. Waddington spent much time in Ottawa promoting his national railway scheme, and it was here, in February 1872, that he succumbed to smallpox. As was common for prominent Ottawans at the time, he was buried at St. James Cemetery, across the Ottawa River in Hull, Quebec. I have passed by this cemetery hundreds, if not thousands, of times, though I have never been in. It lies on the main route between my childhood home and downtown Ottawa, and is only a few hundred metres from my junior high. 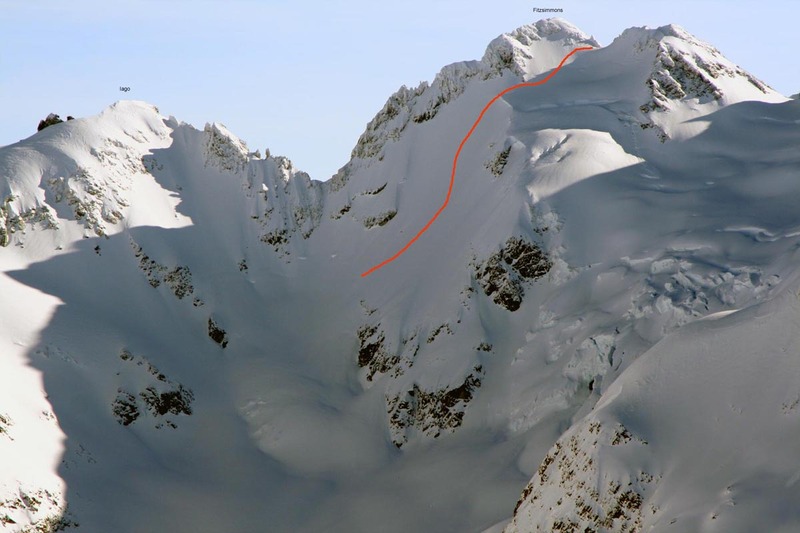 Little did I know that in that unassuming field lay such a close connection to the great peak whose jagged summit astounded even Sir Edmund Hilary when he, accompanied by Phyllis Munday, toured Mt. Waddington in a helicopter in 1955. Alfred Waddingtons gravestone, St. James cemetary, Hull, Quebec. It reads: ALFRED WADDINGTON the original promoter of the CANADA PACIFIC RAILWAY. Born at Crescent House, Brampton, London, Oct. 2nd, 1801. Died at Ottawa, Feb. 26th, 1872. At he time of Waddington’s burial, just a few kilometres down the road (in Aylmer, my hometown), lived a teenager named James McArthur, Perhaps he was prone to dreaming of mountains, sight unseen, as well. for within a few years McArthur made the move out west to work for the Dominion Land Survey. 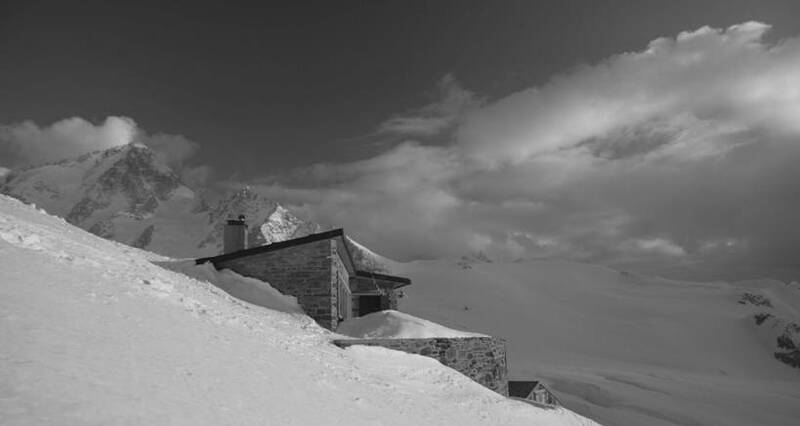 "The Field Hotel below Mount Stephen, British Columbia" by Edward Roper. Painted in the same year as J.J. McArthurs historic ascent of the same mountain. Courtesy collectionscanada.gc.ca. McArthur would have a long, successful survey career, first in the Rockies, and later in the St. Elias Mountains, eventually being appointed Canadian Commissioner of the 1917 survey to locate the boundary between Alaska and Yukon Territory. 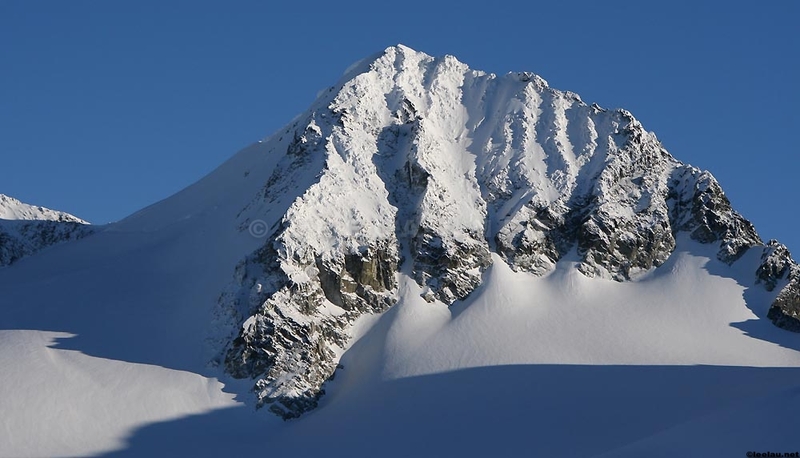 When I was fifteen, on my first visit to the Canadian Rockies, I can recall being surprised to read the name “Mount Aylmer” written above a massive pyramid-shaped mountain on one of those interpretive panoramic photos which one finds at roadside lookouts in our national parks. I figured the name was just a funny coincidence with as little to do with my home town as the canned tomatoes. 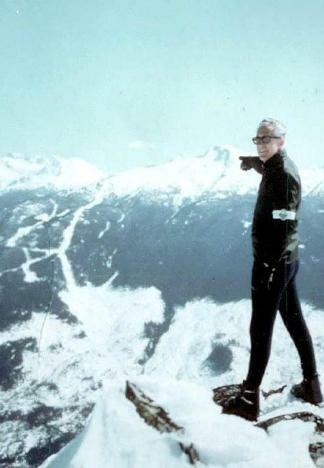 In fact, the peak was another of McArthur’s many first ascents, and he felt it appropriate to commemorate his eastern roots by attaching the name of the west-Quebec logging town to the highest peak near Banff. Many historians and public figures have celebrated Canada’s western mountains (often, incorrectly, referred to collectively as the Rocky Mountains) as symbols of national identity. Certainly, the allure of our mountain landscapes resonate far beyond their immediate neighbourhood, and it is perhaps worth pondering how many life trajectories have been shaped by these unyielding peaks. What a find. I definitely need to track down the rest of the volumes through an on-line used book store. "Eocene Life Fleeing a Volcano." Growing up, dinosaurs were probably my most serious mania. I really enjoy the thought that this exact scene, depicting the wave of volcanic activity that formed the Coast Mountains a few dozen million years ago, occurred just up the street from where I live today. Beyond the inherent interest of the subject matter, I really enjoy browsing older environmental literature and educational materials for the window they offer into changing popular environmental attitudes. Published in 1970 by Natural Science of Canada, the series offers a cool expression of the growing concern for environmental degradation that followed such landmark events as Rachel Carson’s Silent Spring (1962) and which was reflected by major shifts in North American environmental policy. 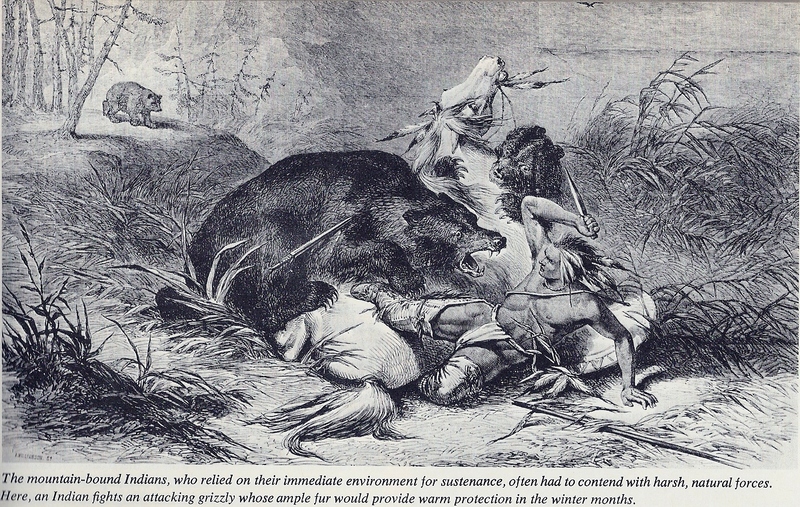 The Illustrated Natural History of Canada, the publisher claimed, was “devoted to explaining and illustrating the entire natural formation and development of our country…. ” Beyond this popular science component, the series was clearly inspired by a desire to instill in the Canadian populace an appreciation of our nation’s natural wonders, and a concern for their imperiled state. Each volume concludes with a chapter outlining major conservation concerns in its respective region, offering as a scathing condemnation of the era’s over-zealous “development-at-all-costs” economic policies. I often find myself leisurely browsing through my two volumes, no less entranced than I was by Wings, Paws, Hooves, and Flippers two decades earlier, so I figured I’d scan a few of my favourite images and post them here. "The Mountain-bound Indians." A completely accurate portrayal of day-to-day life of the region's indigenous peoples. If a picture is worth a thousand words, then a lot can be said about as picturesque a place as Whistler. Thanks to the efforts of a century’s worth of residents and visitors, a rich photographic heritage exists documenting the landscape surrounding what is today Whistler, British Columbia. 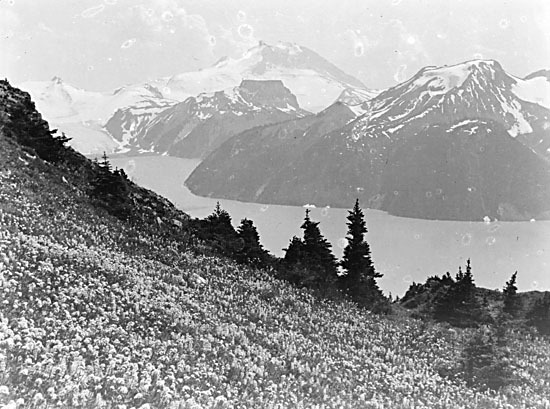 While pioneers such as the Alex & Myrtle Phillip recorded the nascent settlement of Alta Lake, mountaineers such as Neal Carter and Don & Phyllis Munday captured images of climbers at play amidst panoramic alpine vistas. Since the start of ski resort development in the 1950s, the photographic record has grown exponentially. Landscape is, arguably, Whistler’s defining feature. As any number of marketing campaigns plainly demonstrate, lifestyle-oriented residents and adventure-seeking tourists from around the world are drawn to Whistler by the beauty of the region’s natural environment. Natural it may be, but millennia of human activity, intensified over the last fifty years, have left their mark on our cherished landscape, for better and for worse. Hunter and dog in the Fitzsimmons Range near Whistler Mountain, 1920s. Overlord Mountain and Glacier in background. 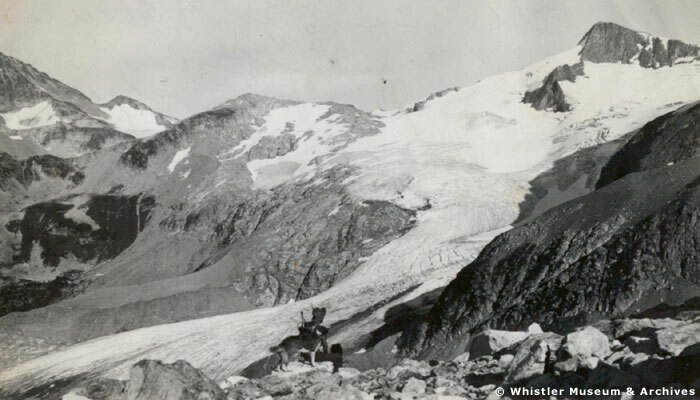 Courtesy Whistler Museum and Archives Society. Both local and global processes have effected our regional ecology. A First Nations trail followed by early prospectors and settlers became a dirt road navigated by keen post-war skiers, and is now the four lane Sea-to-Sky Highways linking Whistler to Vancouver and the world. A town of 12,000 (give or take, plus over 40,000 hotel beds) emerged seemingly overnight. Ski runs, chairlifts and gondolas crisscross (and even span between) two mountainsides. Franz Wilhelmson pointing out the ski area that he helped develop. Early 1960s. Courtesy Whistler Museum and Archives Society. Many strong visions for the development (and prevention thereof) of our surroundings have been put forth. Rarely have they gone uncontested. Recent examples include the Peak-to-Peak gondola; disparaged by many local residents as an expensive eyesore, it is an undeniably cool, if somewhat useless, ride. Meanwhile, the ongoing debate over logging in the valley demonstrates widespread misunderstanding divergent opinions of resource industries in our valley, past and present. In addition to these various human factors are many inherently capricious environmental processes–from wetland ecology to climate change. Clearly, our region’s current landscape is the result of a complex array of disparate factors. Inspired by the Mountain Legacy Project and other initiatives, I figured that “repeat photography” would be an excellent way to simultaneously celebrate the Coast Mountains’ beautiful landscape and examine the drastic changes that our region has undergone over the years. Essentially, I hoped to take old photographs like the one above, and “re-photograph” the same location to show how the landscape and the people within it have changed in the intervening years. This pairing of past and present photographs will add temporal depth to the images, augmenting our capacity to evaluate landscape change over time. 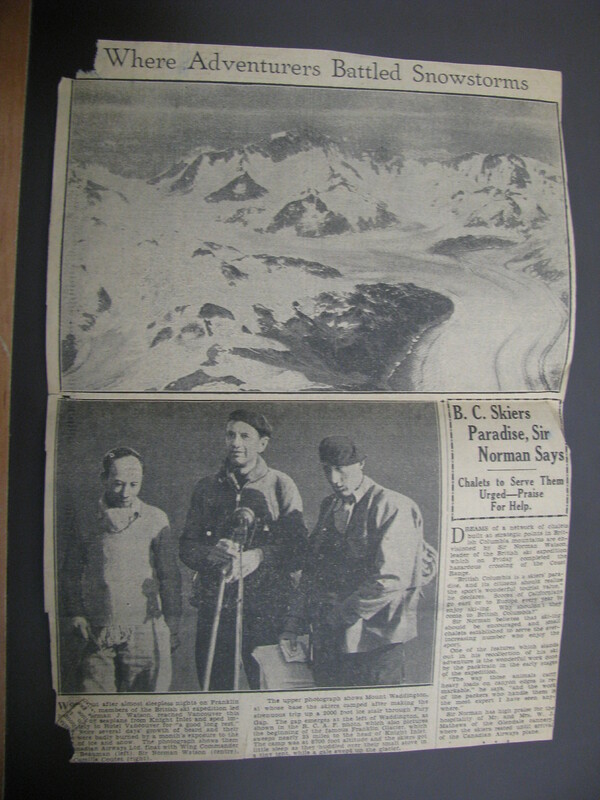 While historic-contemporary image pairings will be the focus of the project, other archival materials such as climber’s journals, survey reports, and maps will also be examined to provide context for the photographs. I recently received the good news that my proposal for just such a project, to be developed in partnership with the Whistler Museum, will receive support from the Network in Canadian History & Environment (NiCHE). Click here for the full list of projects NiCHE will be supporting this year . For some rough examples of what a repeat photography exhibit would entail, take the following image pairs. 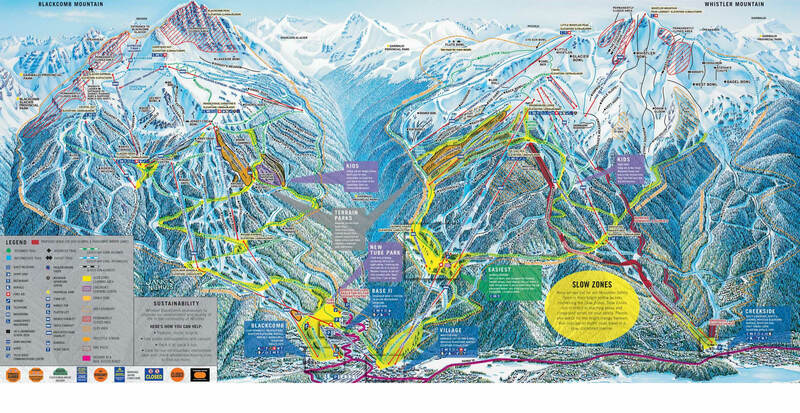 These two trail maps (not photographs, but demonstrative images nonetheless) illustrate the extent of the ongoing development of runs, lifts and other infrastructure on Whistler and, later, Blackcomb Mountains, now North America’s largest ski resort. 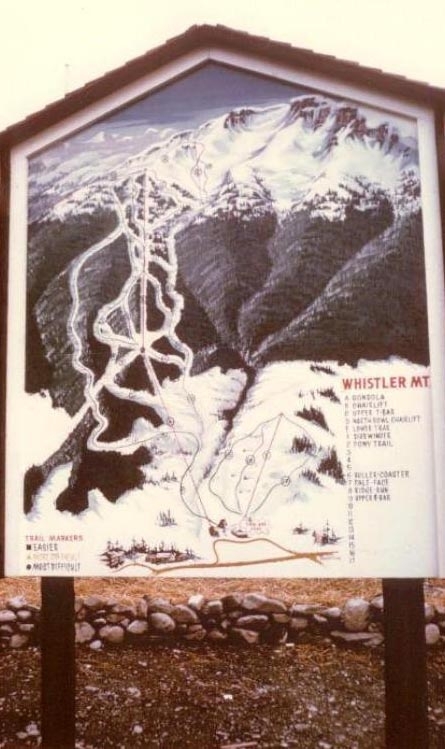 A trail map of the Whistler Mountain from 1966. Deforestation, erosion, and pollution have ensued, but the ski area’s ecological impacts are not as overwhelmingly negative as one might assume. For one, Whistler-Blackcomb has made efforts to ensure that cut ski runs remain viable wildlife habitat. Such clearings can often provide more food (shoots, berries, etc.) for large game animals than mature forest. This fact that was well understood by many indigenous societies which regularly burned wooded areas to support large game populations. Whistler and Blackcomb Mountains continue to support large wildlife populations, including the several dozen black bears that are a common sight in summer. These next two images, portraying Garibaldi Lake and Mount Garibaldi from the aptly named Panorama Ridge, span almost eight decades. 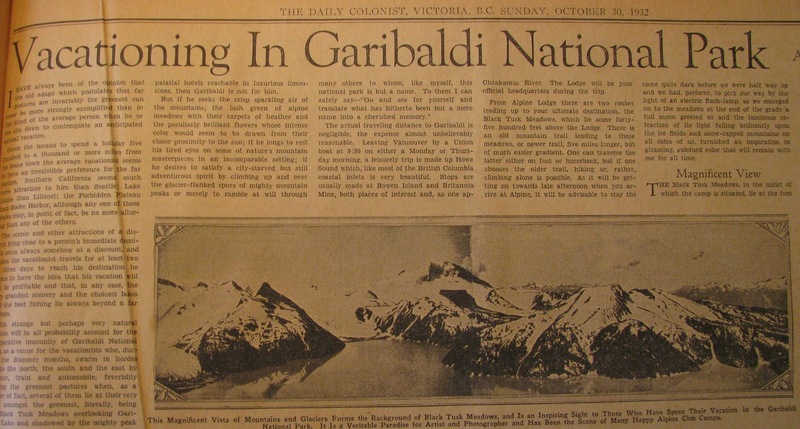 In this case the photographic record clearly documents the effects of climate change–the massive recession of the glaciers on the north slope of Mount Garibaldi–on a landscape that is widely recognized as “pristine” wilderness. 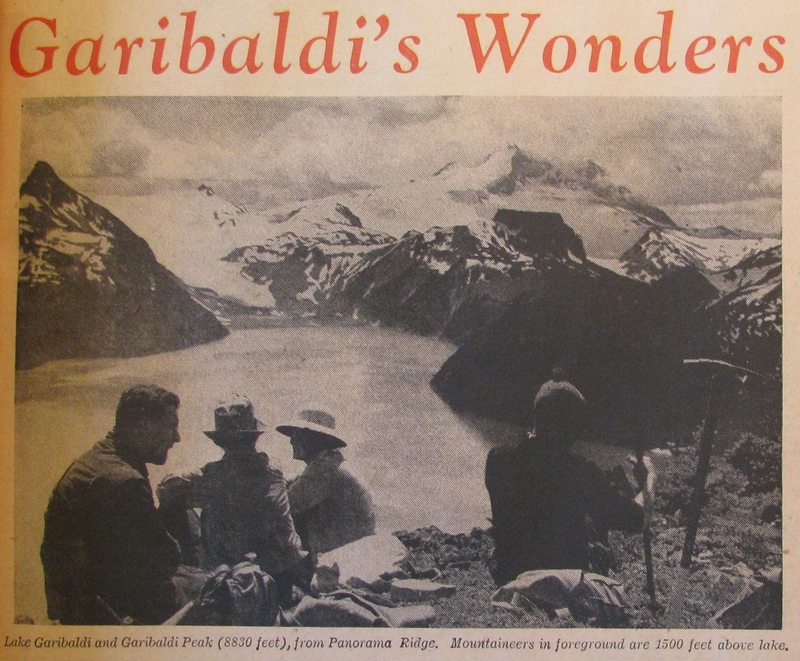 Mountaineers on Panorama Ridge take in the view of Garibaldi Lake, from a 1943 Vancouver Province article. A contemporary image of the same vista, minus the hikers. Courtesy Wikimedia Commons. Although I hope that the image pairings will provide insight into ecological change, the project is not intended to produce results of a scientific rigour. Still, the precision of repeat photography makes the medium an effective means of informing dialogue about a variety of environmental issues. Additionally, the aesthetic qualities of the Whistler landscape as well as the human presence in the photographs will present the opportunity to explore the cultural aspects of the human-nature relationship. 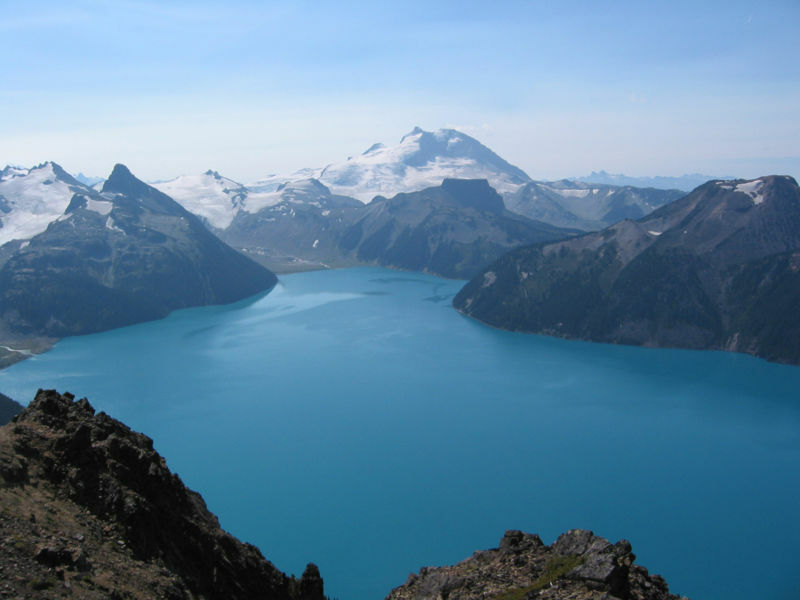 I have found several near-identical images, for example, of Garibaldi Lake like the two shown here. 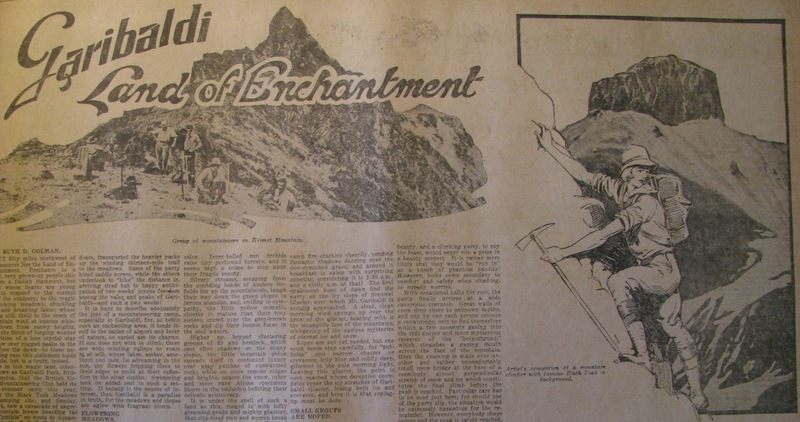 Drawn from a variety of newspaper articles, government reports, and tourism brochures from the inter-war period, these vistas of a serene lake amidst sublime glacial peaks were used to portray Garibaldi Park’s “diversified charms,” a recurring catchphrase in promotional literature for the park at the time. If I choose to rephotograph the Vancouver Province image, or other pictures that include human subjects, I will also have the pleasure to get my friends involved as contemporary figures to contrast with those in the historical images, their fashions, activities, and attitudes. It is this potential to explore cultural and natural history at the same time that excites me most about this project.